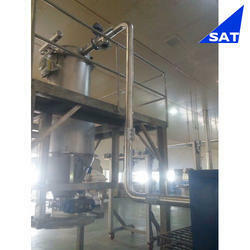 We are offering Vacuum Conveying System. Galaxy Sivtek Pvt. Ltd, SS Vacuum Vibro Sifter, 24"-40"
The Pneumatic Conveying System is using for conveying Powder (Bulk Density = 0.5 to 0.6 gm/cc). Pneumatic conveying System works on negative pressure for conveying the material from one or number of pickup points to one discharge point. This system is best suitable for providing dust free conditions around inlet. We are one of the renowned Manufacturer of Pneumatic Conveying and Air Fluid Systems. These meet the demands of cement fertilizer industries and power paper plants. We are recognized as leading manufacturer and supplier of a wide assortment of Vacuum Conveying Systems which are designed and engineered using premium quality raw material and as per international quality standards. We are the leading wholesaler of Vacuum Conveying System. Vibrant Marketing has launched new models of pneumatic conveying machine which can be used for conveying any types of free flowing items / commodities. We have many installations done worldwide and have expertise knowledge when it comes to offering a custom based solution for our customers. The unit allowing for reduced manpower and better GMP. It is ideal for linear flows and allows for faster operations with minimum dust generation and reduced change overs. The unit totally movable typewhich can be placed near the blender and can be loaded through the container one by one. Available in capacities of 60 to 100 kgs. The single wire distributed Easy3 control, along with a broad range of granule receivers with volumes from 1.5 through to 140 litres. - Effective and rapid cleaning operations. - Complete stainless steel construction. - Central material intake port. - Vacuum conveying system is suitable to transfer up to 6000 kg/Hr.Conveying Distance: 3 to 30 meters with long radius bends. 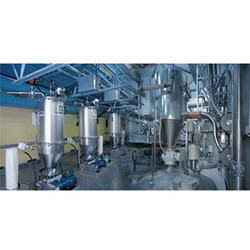 - Automatic filter bag cleaning system by reverse jet arrangement. Custom designed high transport rate, efficient pneumatic conveying systems for wide range of applications & to handle variety of materials. Compact, economical, dust free & closed operation. We are instrumental in manufacturing and supplying a wide range of Vacuum Conveying System. The system consists of Cyclone Separator, Bag filter with Turbine Blower, and De-clogging arrangement, Structure stand, Bottom Butterfly valve at cyclone, Electrical control panel, pipe fittings, interconnecting pipes (options). It would be used to transfer powder from Siever discharge to Vertical Conical Blender.